These workouts by Nate Palmer at T-Nation shows how to burn more calories and obliterate body fat without cardio! Palmer describes how to use 5 different methods when weightlifting to burn 450% more calories. His methods are: rest pause, cluster sets, drop sets, back off sets, and rep challenge sets. Using short pauses then continuing reps in these programs will crank up the intensity of any routine to incinerate fat and calories! These all require a pause of 15 seconds, and the Gymboss interval timer will do exactly this. Simply set the rest pause time you desire, such as 15 seconds, and clip it to your waist. Upon completion of your reps, push the start button to begin timing the 15 seconds, when it alarms indicating 15 seconds has elapsed, do more reps, repeat. Below is how your Gymboss will be set up for this. This is a simple way to consistently time these short pause rest times and there is no need to monitor the timer as compared to a stopwatch, wall timer, etc. You focus on the workout, let Gymboss do the timing. 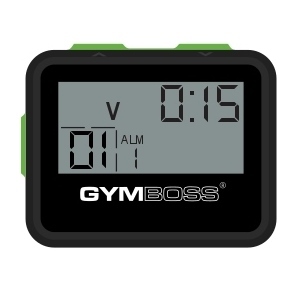 The Gymboss is also a great workout timer for 5 minutes of cluster sets. To use it figure the time it takes you to do the reps in each cluster. For example if a 3 rep cluster takes you 10 seconds, add the rest period you want between clusters, say 20 seconds, then divide the total into 5 minutes by this to get the number of cluster sets you will perform. 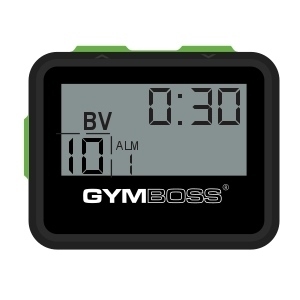 The Gymboss serves as an interval timer, weight lifting timer, and workout timer, and for many different uses such as rest pause training, cluster sets, as well as any interval training routines.